This glace recipe, called glace de viande, is a concentrated reduction of ordinary brown stock. Glace de viande can be used to fortify sauces, and a spoonful of glace de viande is a great way to add flavor to other dishes. It stores well in the freezer, so in a pinch you can add water and turn the glace back into stock again. Glaces are simple to make—you just reduce the stock until it turns thick and syrupy. A word of caution, however: If you make a glace from store-bought stock, make sure it is unsalted. Otherwise, your finished glace will be insanely salty. To avoid this problem, you can make your own brown stock. Glace de viande differs from demiglace in that it is much further reduced. 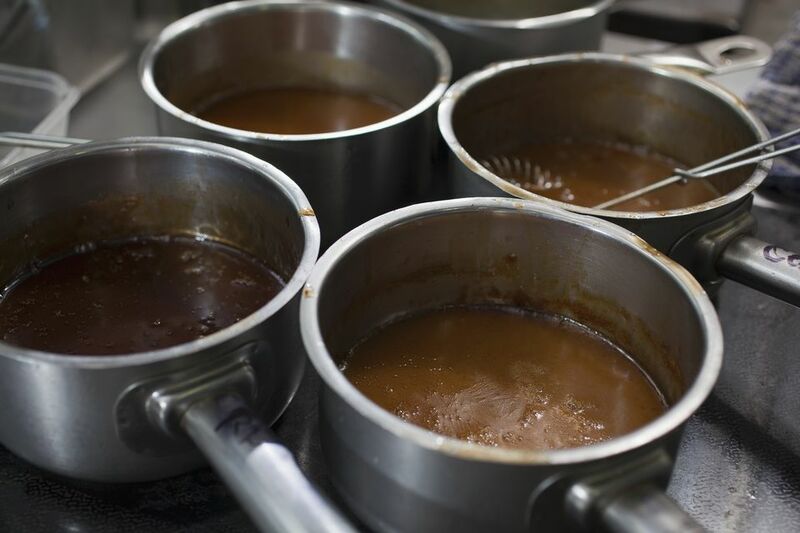 While demiglace is stock that is reduced by half to three-quarters, glace de viande is reduced by a factor of eight to 10, until it is syrupy. When using glace de viande in a recipe that calls for demiglace, you may wish to use about half as much. Equipment needed: You will need a burner, a large heavy-bottomed saucepan, and a smaller pan for boiling the stock. Have a skimmer handy to remove any scum from the surface. You'll need a mesh strainer and cheesecloth, and a storage container or freezer bag. In a large, heavy-bottomed saucepan, bring the stock to a boil and then lower the heat to medium. As the stock simmers, you may see scum or other impurities rise to the surface. Skim these impurities off with a ladle. Once the stock has reduced by a little over half, pour it through a mesh strainer lined with cheesecloth into ​a smaller pot. Lower the heat a bit and continue reducing, skimming as needed. The glace is finished when the liquid has reduced by over three-fourths and the glace is thick and syrupy. When you stir it, the glaze should coat the back of your spoon. Transfer the glace to a container with a lid and refrigerate or freeze. If freezing, you may want to freeze it in an ice cube tray in small portions to use in your recipes. It should solidify into gelatin in the refrigerator and you can cut it into cubes to be frozen. If you have a silicone mini-muffin form, you could freeze a tablespoon in each section. As recipes often call for only a tablespoon, freezing in small portions is a convenient way to achieve this. Press as much air out of the storage bag as possible before freezing. Label the container with the name of the item—glace de viande (or meat glaze) and the date that you prepared it. The glace de viande should have a shelf life of a year when frozen.